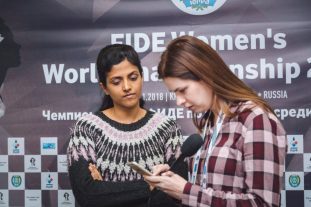 An interview with Harika Dronavalli from India after her victory over Bela Khotenashvili from Georgia in the tie-break of Round 2 of the Women’s World Championship. 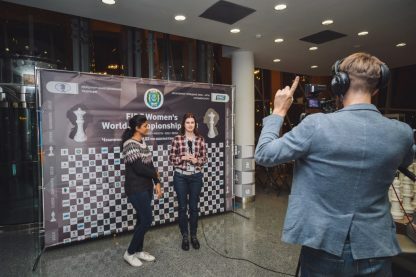 – Harika, please tell us how it all went today. – I was clearly winning at the ending of my first tie-break rapid game with the white pieces. But then I messed it up and drew the game. I was in a frame of mind that I should somehow fight further and I should not think about the game. Immediately after five minutes the game started, I kept telling to myself that it’s common not to win and that such things happen. I tried not to focus on that and kept concentrating on the game. I easily got a good position in the second game with Black and from there I just kept getting chances. I took them, got a better position and eventually won. – This is your second time in Khanty-Mansiysk for the Women’s World Championship. And you are here with your grandmother again. Does she bring luck to you? – I have been always travelling with my grandmother for all important tournaments. It is easier for me because she takes care about everything. This is a long tournament, and it is always better to have someone near. She is getting used to the cold of Khanty-Mansiysk, but as you said this is the second time for her to be here. – You got married this year. Congratulations! How has your life changed since that moment? 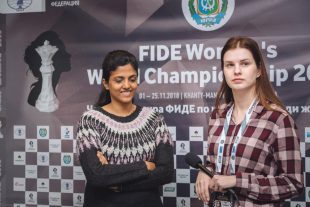 – I didn’t even have time to understand how life has changed because I had to prepare for the Olympiad immediately after the marriage, then I played the Olympiad and had to prepare for the World Championship here. So I didn’t have time to even understand how life has changed. I will do it after this tournament. – Is your husband going here to support you? – No, he came to the Olympiad, but he will not come here because it is too cold for him. He is not used to cold. He has problems with cold, so that’s why he couldn’t come here.